Summer is here.I wanted to share this project . I had some left over shells and beads from a bracelet I used on another project.. and wanted to try to create shell napkin rings. I had found these plain wooden napkin rings at a thrift store . The first thing I did was cut a slit through the napkin ring, just on one side. This will make it easier for me to wrap the sisal around the ring. I first put a dab of hot glue to the end inside to hold it tight when wrapping. I started bringing the string through the slit and just kept wrapping it around. When I was finished covering the napkin ring with the sisal, I then sprayed it with matte clear. I was hoping that this would keep all the unruly little ‘hairs’ on the sisal would stick together. This did make it easier to snip them off, leaving a clean look. I gathered my shells, gold beads and pearls together. In hind site, if I was using a thinner string I could thread them through the shells and beads like I did with the other napkin ring. But…I had this sisal and wanted to use it, it looks beachy. I began gluing the shells onto a piece of sisal approx 5″ long. I added a pearl and gold bead above the shells. On the other side of the piece of sisal, I did the same. I made 2 of these strands. I then held the 2 strands in the center ( the shells and beads were dangling), I then made a knot. After I was done with that I realized I need 1 more strand…so now I have 5 strands all together. I glued the onto the napkin ring with ‘Goop” multi purpose glue. I think they came out pretty! With the other napkin ring, I started by painting the ring. I then used some string, and made 12 lengths 5″ each. I think it came out pretty nice. Perfect for the fall. 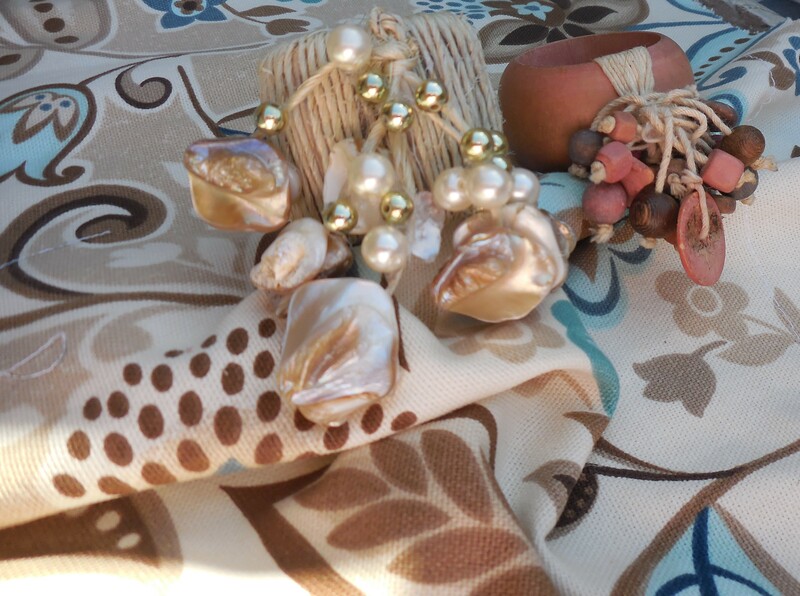 Wouldn’t these shell napkin rings would look so pretty on your table. Thank you so much for looking! I love these! Great job on the design! Thank you Robin, I am so glad you liked them! I like how your are crafting things… Let me know if you are going to put them on the market.